During the summer we have tended to get less of a turnout, what with people going on holiday, choosing to spend their time outside or watching the athletics on TV. Ten intrepid boardgamers weren't tempted by any other way to spend their evening last Wednesday and instead rolled, flipped, shoved and carefully placed stones, pawns, cubes and discs on a board from 7.30 until the London Apprentice closed and called a stop to everything. What tremendous fun! Paul stepped in to guest edit as no August editor has come forward. A quick game of coloured chameleons whilst we waited for the extraordinarily late Mr Sinden ! Quick refresher on the rules and off we went. Nothing much to report other than the arrival of food, a bit of light banter and the eventual appearance of said Mr Sinden. The first of two adventures for the intrepid trio of Sinden, Dawsey and Horabin. The latter had reread and reread the rules and James still found more, between them they had at last covered the lot… or had they? With a gentler touch James took control of the bigger tiles early on with me deciding to get the bonuses for taking my man to the next town asap. Paul enjoyed the shoving but was a little hesitant in road construction and so built an amazing supply of small stones. Money wasn’t the issue it had been, in fact in was flying around the table, and certainly made for some easier decisions mid-game. It was around this time that James’s rule reminders came in very useful for all. And don’t let Paul or me tell you different. Ever. Late on in the game Paul was getting in the swing and moving forward with his road construction and man movement quite nicely. James was still picking up good points for the larger tiles and I was sticking to my ‘get the man to Brundisium asap’ which brought an early ending to the game. During the final count up James maintained his lead with some good construction bonuses, and Paul overtook me comfortably too. And we had all the rules sorted too, every single one of them, hurrah! We also agreed that this is, in fact, a quite brilliantly constructed game. The flow through income – crushing stones – building roads – using roads is simplicity itself, but makes great sense and, once you know all the rules, it works very neatly too, no money worries at all. Our second adventure brought us forward in time but out in the jungle lands. James’s rule explanation was exemplary and we were soon off destroying forest and looking for treasure and lost temples. Whilst James and Paul got cosy around a few temples I decided to stay clear of them. Paul had an uncanny knack of uncovering the volcanoes and first scoring round went ok with me only a little behind. Unfortunately it was the second one that made me understand I was nowhere near where I should have been. Paul sealed a temple early on with James following suit when he’d built it up to the maximum value of ten. They also pitched a few tents whilst I tried to reposition my little fellows. James and Paul scored ok although both were getting in each other’s way over one average value temple. James’s collection of jewels was impressive and helped him maintain a good lead. Final round and I suddenly found myself with a neat little network of temples. A late tent building exercise allowed me to move in for some good late points, not enough but not too bad either. Another thoroughly enjoyable game and again setting up the terrain and using your ten actions each turn felt you were at least trying to plan something. Will be very keen to have another go at this again soon. Scores: James 122, Neil 113, Paul 108. This was a three player game between me, Andy and Woody. All of us had played before, Andy most recently. Woody went first with no plantation, me second with indigo and Andy third with corn. Woody opened conventionally with Settler Quarry- I picked up a Coffee and Andy a Tobacco. I followed with a Small Market, as did Andy. Woody passed, waiting to man his Quarry. The game continued with my obtaining a small Indigo plant and a Hacienda as well as a Corn plantation. Woody picked up a 2nd Quarry. Woody spent several turns not producing any goods while Andy was first to produce and sell and ship, placing 2 corn on the size 6 ship. Woody built a Large Market and a Hacienda and a Hospice and began building up production. At some point I shipped - placing another 2 corn on the size 6 ship. Andy had left off corn for sugar and tobacco. I saved my money and bought a Coffee roaster and a Large Market, enabling me to sell my Coffee and then buy a Wharf. By this point I had 4 corn plantations and so was able to produce 5 corn by taking the Craftsman, which I then shipped with my Wharf. The size 6 ship stayed loaded with 4 corn- becoming 5 corn later in the game when Andy had a colonist free to man his corn plantation. And as there are only 10 corn in the game I now had a corn monopoly (if only I took Craftsman- which held true after I had manned my 4th corn plantation. Only I took Captain for that matter, that is in the late part of the game after I'd built the Wharf). While I had been busy setting this up neither Andy nor Woody were idle. Andy invested in a University and set about buying two large buildings- Woody bought two as well and I somehow found the cash for the remaining large building- the one that gives you bonus VPs for VP chips. As only I was really taking VP chips there were plenty left at the end. The Colonists nearly ran out, but the game ended with both Woody and Andy filling their building displays. Post writeup note from a comment made when this review was posted on Board Game Geek: "Note the rules error pointed out by the first reply, looks like Woody should have done better..."
Woody and Andy and me played this fast game of Stone Age, Woody starting. I concentrated on taking the Farm (increasing my Food level) and initially obtaining as much wood as possible. I then switched into building huts, obtaining other resources partly from cards and partly directly. I focused on one stack of huts so as to end the game quickly. I had good luck with the Farm (and also cards that boosted it) and never had to hunt for food. I had a few Farm multipliers and later picked up some Hut multipliers as well. Andy took the Farm but also increased his supply of people and collected pictures and people multipliers. He built up lots of high value resources, which worked well when a 1-7 Hut came up near the end of the game (the penultimate hut in the stack I was drilling). He rarely needed to hunt because he had food from the picture cards as well as the Farm. Woody focused on obtaining tools, which often had to be used for hunting. He collected cards of all types. Unfortunately for him only 3 tool multiplier cards came out and not enough pictures for both him and Andy. He took the last Hut in the stack I was drilling- a 1-7 Hut- but ended up using a single piece of Wood to build it (I would have built it next turn otherwise so he decided not to prolong the game). - Cheese seems to be dangerous in this game. We overheard. A top for anyone playing in the future that might arrive late for the rules explanation. - It's a co-operative game and they won! 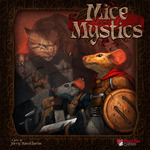 Some of the Mice and Mystics players went on to trade beans in Bohnaza but we know much less about what happened in that than in the previous game.